Ukraine & Nepal – World Joining Us! My friend in Ukraine started to learn Hindi. She is intersted in India and like music or art there. I got e-mail from her when I was in Nepal. So I replied “Namaste”. Then she replied me “Namaste” and she told me she just started to learn Hindi. Next day, I visited Pokhara in Nepal and met a girl. She is same age of my friend in Ukraine. So I told her that there is a girl who is studing Hindi in Ukraine, far from Nepal. (Actually, Hindi and Nepali is different but people in Nepal can understand Hindi,too. )She was surprised about that. And yesterday,a boy in Ukraine saw photos that I took in Nepal on Ukrainian SNS and gave me some comments about it. “What a wonderful world!” He likes photos of lake in Pokhara and temple in Kathmandu. Now two Ukrainians are interested in Nepal at least. 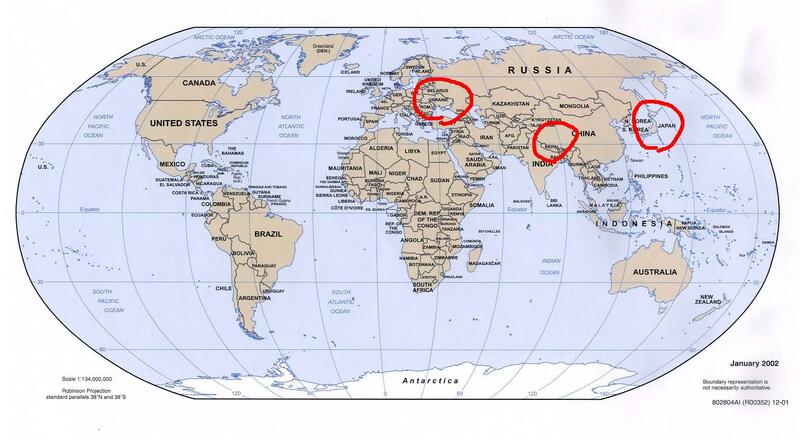 Most of Japanese also don’t know where is Ukraine and some of them don’t know where is Nepal. However I hope they can notice each other by telling them about the other country. Of course, I don’t know everything about foreign country, even about Japan. But “know a little” is first step to understand each other. Maybe it’s happy if people in another country are interested in your country, right? I hope friends of mine become to be interested in each other on this blog.